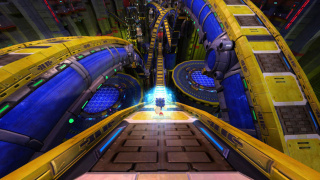 Chemical Plant is the second stage in Sonic Generations for the PC, PS3, and Xbox 360. Classic and modern Sonic are sent back into the industry and Mega Mack of the original Chemical Plant Zone from Sonic the Hedgehog 2. Act 1 starts off in a familiar manner, with the 2D sidescrolling soon augmented by chemical waterslides and collapsing red platforms that didn't appear back in the Zone's first iteration. Act 2 is full of boostable roadways and swinging cranes, as well as the ever-delightful shifting yellow-blue blocks in the 2D sections. 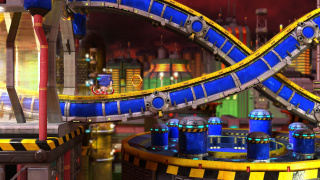 At a certain point in Act 2, the factory goes into "red alert" mode, and background structures start collapsing and exploding as Sonic passes by. Both acts feature sections submerged in the well-known pink water, which has air bubbles this time around; and both Sonics will have to move up a vertical room with rising water. Having run through Green Hill Zone and emerged none the wiser about the nature of their predicament, modern Sonic is sent by modern Tails to check out the buildings in the distance. As soon as he's gone, classic Sonic turns up and rushes off to do the exact same thing, much to Tails' confusion. When the modern hedgehog and fox re-rendezvous, they both agree that de'ja vu hangs thickly in the air of Chemical Plant - along with the distinctive odour of Mega Mack. Once both Acts are completed, Amy Rose is unfrozen outside. As with all the characters apart from Tails and Vector, she has a different reaction depending on whether it's modern or classic Sonic who does the saving; in the latter case, asking him for anti-aging tips. Grabber — Spider-like badnik that hangs from the ceiling. If Sonic stands around underneath, they'll descend and grab him in their claws before self-destructing. With no Tails around to spin attack you to safety, the only way out is to furiously wiggle left and right until it lets go. In a 3D section, they can be found crawling around on the ground. Spiny — Slow-moving octahedral enemy that can stick to walls and ceilings and toss out energy spheres from their heads. Often positioned in particularly inconvenient places.